This time of year questions about frost/freeze potential are common as producers look for a little more time for crops to mature, or gardeners and horticultural interests hope for some extra days to collect a few more tomatoes. Projecting specific frost dates are difficult beyond using models out to 1-2 weeks. Thus, climatologies and current crop progress become very important. NOAA Seasonal Outlook – Cooler in the Northern Corn Belt This Summer? On June 19, the NOAA Climate Prediction Center released their latest monthly and seasonal outlook of temperature and precipitation for the US. One of the factors that will likely come into play this fall and winter is the developing El Niño event in the Pacific Ocean. Here is the breakdown of the outlooks. Unshaded areas show an equal chance of above, below, or near-average conditions and are labeled “EC”. Click on any map to enlarge. There is an increased chance of cooler-than-average conditions in July for eastern Montana and Wyoming, northeast Colorado, western Nebraska, and nearly all of the Dakotas, Minnesota, and Wisconsin. The rest of the Corn Belt is in the “EC” category. At the same time, the Southeast has an increased chance of warmer-than-average conditions. For precipitation, there is an increased chance of drier-than-average conditions in southern Missouri and Illinois. Meanwhile, there is an increased chance of wetter-than-average conditions in the Rockies and the western portions of the High Plains that could bring some relief to parts of drought-stricken Colorado, Nebraska, and Kansas. Predicting how we expect field work days to be different in the future based on predicted climate change. Over the period from 1980-2010, there is an overall trend towards fewer days suitable per week during the planting period and more days suitable during the harvest period. There are differences across states, as is shown in the table below. Table notes: All values are weekly reports of the number of days between 0 and 7, averaged over all USDA Crop Reporting Districts in a given state. ** and *** denote <5% and <0.1% confidence levels for t-tests of the directional (+, -) difference in means between time periods. 1 Weeks when planting and harvest take place each year based on USDA-NASS weekly crop progress and condition reports issued by state NASS offices. 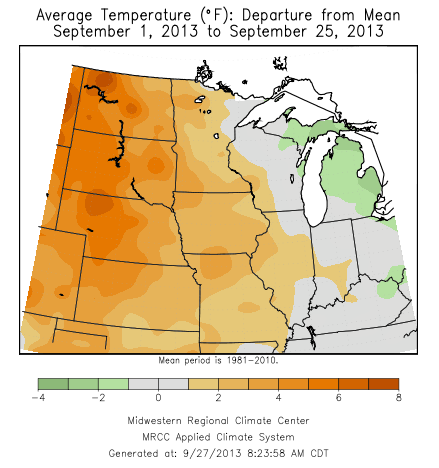 Much of the Cornbelt experienced conditions warmer and drier than average in recent weeks. Temperatures for the first 25 days of September have been above average in the western two-thirds of the region with the departures becoming stronger moving from east to west. Meanwhile, much of Ohio and Indiana as well as parts of Illinois and Wisconsin have been close to average. After planting delays this spring and the cooler than average conditions that prevailed through mid-August, this late season warmth gave corn an opportunity to at least partially catch up in its development. In addition, it has served as an aid in drydown in those fields that have already reached maturity. 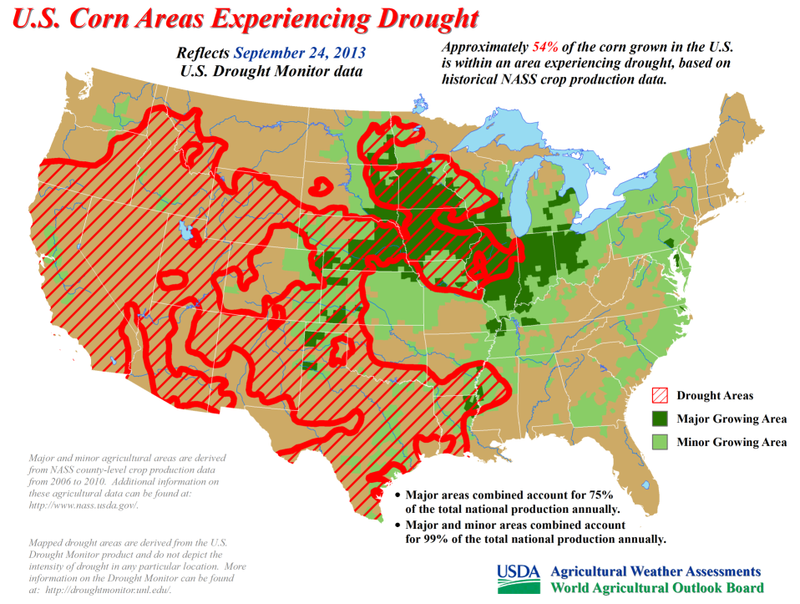 Based on the September 24, 2013, US Drought Monitor, the US Department of Agriculture estimates that 54 percent of the US corn production is in some stage of drought. At this late stage of the growing season, additional precipitation will have little impacts on yields. In fact, any significant precipitation at this point is more likely to be a hindrance as the harvest continues. The most recent US Drought Monitor map shows drought returning to larger parts of the Corn Belt in the last few weeks. This has been driven by warm temperatures over the last part of August. Dryness has existed across parts of IA, MN and SD over the middle part of the summer. But cool temperatures during that same period had reduced the stress on crops. With the return of warm temperatures in the latter part of August, the dry areas began showing stress quickly. Areas of Iowa and Missouri have degraded to D2-Severe Drought with surrounding areas of SD, MN, and IA with D1 – Moderate Drought. In some ways the heat in the latter part of August was welcomed in pushing crops along to development. But the extended period of heat without moisture is stressing crops, pushing some to early maturity and browning. Large parts of the central part of the corn belt are watching for freezing conditions because of the late development. We will post more about that as information becomes available. Missouri has experienced some large precipitation disparities this summer, ranging from moderate drought to historic flooding. The disparities have been especially notable in August. Some south central counties have received 15-20 inches of rain this month, whereas 120 miles to the north…not a drop. Several counties across northern Missouri have received less than 2-inches of rain since July 1, which is more than 6-inches below normal. Crop stress has emerged in the driest areas, with some firing and leaf curling reported, more notably in upland areas, or in soils with higher clay or sand content. Cool July and August temperatures, in combination with below normal ET rates, have mitigated full drought stress potential but corn yields are declining due to the current high water demand of late planted corn, and during a critical growth stage. Soybean growth has also slowed down in these drier areas. Unlike last year, below normal evaporative rates this spring and summer has had less impact on surface water supplies, and they remain mostly adequate despite the extended dry spell across northern Missouri.